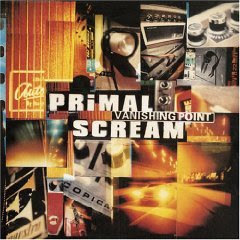 While Primal Scream's Screamadelica was a deep disappointment to me, Vanishing Point is actually a pleasant surprise. This is strange to the extent of their relative fame as albums, but this is without a doubt my favourite of the two. This does not mean that there aren't substantial problems here: the lyrics are pretty bad, for example. This is another reason why the album is better, however, there are plenty of tracks which are almost only instrumental or with a very small amount of vocals. This lets the listener listen to the best thing about Primal Scream, the instrumental inventiveness and this is an album which while being admittedly retro: taking inspiration from a 1971 film, is also pretty fresh sounding if it weren't for the Oasis like vocals and inapt writing which crop up every once in a while. It is named after and inspired by the 1971 film Vanishing Point, especially the song "Kowalski", which is meant to be an alternative soundtrack to the movie. Lead singer Bobby Gillespie said, "The music in the film is hippy music, so we thought, 'Why not record some music that really reflects the mood of the film?' It's always been a favourite of the band, we love the air of paranoia and speed- freak righteousness. It's impossible to get hold of now, which is great! It's a pure underground film, rammed with claustrophobia." Vanishing Point shows inspiration from dub, ambient music, dance, krautrock and other genres, as well as individual bands such as Motörhead, Can, and The Stooges. It was the first album to feature the band's new bass player Gary 'Mani' Mounfield, formerly of The Stone Roses.